Like most people, you probably don’t have a lot of time in the morning to make a hearty and healthy breakfast. But breakfast is the most important meal of the day, so you shouldn’t skimp on it or skip it altogether. Instead, you can take an easier and faster approach that will give you the nutrition you need in the morning without having to waste any time. 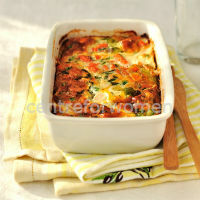 Check out the healthy breakfast casserole recipe below. Add this to your routine and you will find that it’s the ideal morning rush meal. It will be big enough to feed your entire family, and it will save you a lot of time when prepared in advance. For this easy and fast recipe, get a couple of packages of your favorite plant-based sausage rolls. These are loaded with healthy carbohydrates, protein, and natural ingredients, as well as fiber, and they don’t have the cholesterol, fat, and other nasty ingredients found in traditional sausage products. You’ll also need a medium chopped bell pepper, a medium chopped onion, 2 cups of cheese (again, you can go the plant-based route to make this even less fatty), 3 cups of hash brown potatoes that are frozen, a cup of your favorite pancake mix, 2 cups of milk (once again, you can opt for plant-based options here), 4 eggs or your preferred plant-based egg replacer, and ¼ teaspoon of pepper. For this perfect morning rush meal, all you have to do is preheat your oven to 400°F, grease a baking dish that’s around 13x9x2”, and then start cooking your ingredients. Cook your onion, bell pepper, and sausage over medium heat until everything is cooked through. Drain this and then stir that in with the potatoes and all but ½ cup of the cheese. Place the mixture into your baking dish. Stir your pancake mix, eggs, milk, and pepper until they’re all blended together, and then pour that mixture into the baking dish as well. Bake this uncovered for about 45 minutes and then sprinkle the ½ cup of cheese that you’d set aside earlier over the top. Bake for 2 minutes longer and then let it cool for 5 minutes. Store this in your refrigerator, take it out in the morning, quickly warm it in your oven for a few minutes, and enjoy! Even though this breakfast casserole could easily be considered a morning rush meal, it doesn’t look like one and it certainly doesn’t taste like one either. It will satisfy your entire family, it’s healthy, and it will help you maintain a healthy diet every day.